Wanda Duryea is pictured testifying before the House Criminal Justice and Public Safety Committee about a bill to build a new secure forensic psychiatric unit. Standing are Doug Butler, left of Hollis, who testified about his son's stay in the Secure Psychiatric Unit, and Rep. Renny Cushing, sponsor of the bill. CONCORD – It wasn’t the first time that state Rep. Renny Cushing outlined legislation to stop New Hampshire from housing civilly committed mentally ill people at the state prison for men, but on Wednesday he found his most receptive audience to date. 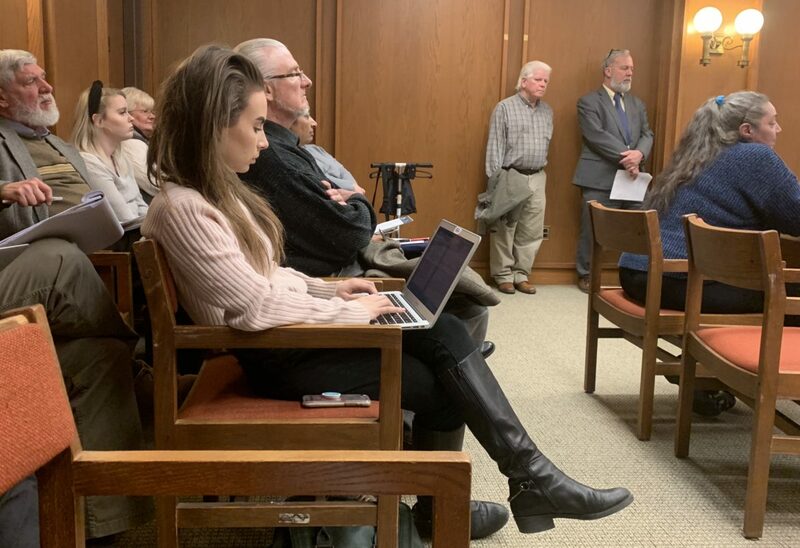 Speaking in favor of House Bill 726, the Hampton Democrat told the House Criminal Justice and Public Safety Committee that it’s time to turn the Secure Psychiatric Unit at the men’s prison over to the control of the Department of Health and Human Services as outlined in his bill. He quoted psychiatrist Dr. Joseph H. Sack’s testimony to a legislative committee in 1985 warning of the problems such an arrangement would make. “The reason for this concern is that the prime purpose of the Department of Corrections is not treatment and that treatment could be overwhelmed by other concerns,” according to Sack’s written testimony. “Because of the Secure Psychiatric Facility’s proximity to the state prison and even its staffing being from the Department of Corrections, the New Hampshire Psychiatric Society feels that civilly committed patients should not be treated there,” Sack testified. Sack’s testimony went on to say that patients would feel stigmatized and noted that it could raise constitutional issues and lead to litigation. “What we really need is a psychiatric hospital,” Butler said. “He’s out of the prison, but in a way, he is still in prison,” Butler said, adding the state forces his son to take strong medications. “He now sleeps 16 hours a day,” Butler said. Andrew had not been charged with or convicted of a crime, he said. The timeframe was a big concern, she said. Making so many changes by July 1 would be very difficult, Mattis said in written testimony. “It’s time for this to happen,” Welch said. “We believe this bill is a good start,” Duryea said. “The hope is a new forensic unit or hospital would be a facility that combines programming so you have a more therapeutic environment but the security that goes along with the Secure Psychiatric Unit,” Shibinette said. Cushing is looking forward to Gov. Chris Sununu’s budget address on Thursday, noting he has called for the end of criminalizing people with mental illness. “What I’m really looking forward to is the day when bills dealing with the Secure Psychiatric Unit” no longer come to his committee, but instead are heard by Health, Human Services and Elderly Affairs.